The last two trading days have seen lots of action within my portfolio. My strategy is to be a bit more active in the options market to generate extra income now and purchase shares at a discount since I have a large amount of capital due to my 401k Rollover. There's lots to report with 3 positions being closed and 2 new option positions being opened. The 2 new positions are new to me in several ways since they stray from my typical strategy of just selling covered calls or puts. On Friday, December 9th I closed out the open put option that I had on Stryker Corporation. If you recall I opened the position on November 9th and received $139.95 of premium upfront in exchange for giving someone the right to sell me 100 shares of Styker. Well, Stryker's share price is still solidly above the $95 strike price of the put option, meaning it's out of the money, so I decided to buy the option back to close it out. In total this was a solid option move that generated a good return. The net profit works out to $74.91 or 0.79% based on the capital "at risk". On an annualized basis that's a solid 10.03% return. I could have let this put option go on longer and held out for more profit; however, I figured it was better to lock in a solid profit and use that capital for other opportunities should they come up. Friday was a pretty active day for me as I closed out another put option that I had open. Becton, Dickinson & Company, and the health care sector in general, has been quite volatile over the last month. BDX's share price has been all over the place since this option was opened trading over $175, then 2 days later it was at $162, 3 days after that $173, then was steady for about a week and then traded back down to $163 and then worked it's way back over $166 on the day I closed the position. That's some pretty big swings although the put option never once moved in the money. Oddly enough the Styker and Becton, Dickinson puts were both opened and closed on the same dates. Unfortunately, the BDX one didn't provide quite the same return as Stryker's although I still can't complain. In total I was able to generate a $64.91 net profit or 0.41% return based on the capital "at risk". On an annualized basis that return represents a 5.05% return. I was tempted to let this option go through to expiration; however, with as much craziness that the share price had seen I decided it was best to close it out and lock in the profit. Apparently the last few days have been a health care put option closing bonanza. This was one of the shorter trades that I've done and it thankfully it worked out wonderfully. On November 22 Medtronic's share price sold off as much as 10% intra-day after announcing earnings and lowering their guidance slightly. That was a huge move and in my opinion it was unwarranted considering the change to their guidance wasn't significant, although it was a decrease to their prior guidance. Like the Becton, Dickinson & Company put option I closed this option out early because expiration Friday is coming up at the end of this week. 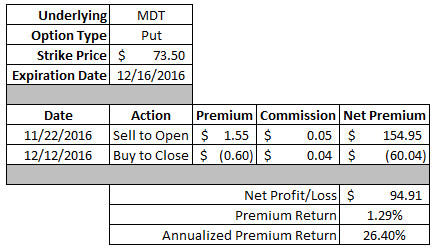 I felt I needed to be a bit more pressing with closing this put option since Medtronic's share price was trading right around the strike price of the option. In total I was able to generate a net profit of $94.91 or 1.29% based on the capital "at risk". Since the option was only open 20 days that works out to a 26.40% on an annualized basis. That's more like it. I've never used a call or put spread before; however, I've been researching the strategy for the past few weeks. I've got a good grasp on the concept although there's nothing like opening a position in order to really learn about it. The basis of a call credit spread is a bearish directional bet on the underlying security. It entails buying a call option and selling a lower strike call option on a security for a net credit. The bad thing about credit spreads is that your profit is defined when the position is opened, although so is your risk. So you know when you open the position the most you can make and the most you can lose. With 2 different options open at two different strike prices there's lots to cover for how this can play out. Let's start with the easy ones. The maximum risk or loss that I can take is $128.54 and which would happen if Starbucks' share price is at $60 or higher. The maximum profit I can make is $121.46 which would happen if Starbucks' share price is at $57.50 or lower. Between those 2 levels though things vary depending on what price Starbucks is trading at on expiration. The important level to know within this range is the break-even price which is the price that Starbucks must be trading lower than in order for me to start generating a profit. Based on this call credit spread that works out to $58.71. As I mentioned earlier this is a directional bet that between now and expiration date Starbucks will trade lower than $58.71 in order for me to start generating a profit which is just about where the share price currently sits. Ideally the share price would move well below the $57.50 level. My target to exit this position is capturing 50% of the max profit or ~$60. 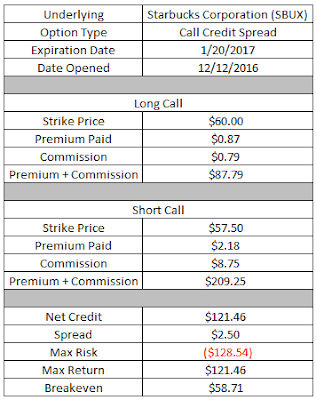 I wasn't satisfied with making just one call credit spread; I just had to make another one. The second one was opened on dividend favorite Realty Income. 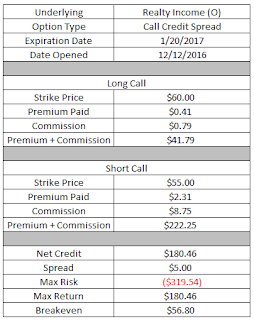 The maximum risk/loss that I can have on this call credit spread is $319.54 which would occur at a share price above the long calls' strike of $60. The maximum return/profit that I can make on this call spread is $180.46 which would occur at a share price below the short calls' strike of $55.00. Between the two strike prices the important price to know is the break-even price, i.e. the price that the shares must be trading lower than in order for you to start making a profit. In this case that's $56.80. Currently the share price is trading at $56.18 so the position is currently profitable. I think this is a pretty solid move considering the likely move in Realty Income's share price is lower rather than higher. As in the Starbucks call credit spread I'll look to close out the position if I can capture 50% of the maximum profit or ~$90. Overall I'm happy with how the 3 health care put options worked out as they generated solid income via option premium profit over a relatively short time. Thus far in December I've generated $278.74 in option profits and since September I'm currently +$505.15. Even better is that includes the Target Corporation call option that went horribly wrong and is currently showing over a $320 loss. Excluding that loss since there is still a portion of that trade open since I rolled it up and out brings the profits since September up to $828.89. I'm not sure how the call spreads will end up working or whether I'll continue to use them in the future although I'm willing to give them a chance to see how they do as far as generating extra income. There's a lot more that I need to learn regarding options trading in regards to credit spreads specifically with probabilities. Although I figure that it's best to jump in with one foot on the shore and one foot in the water in order to test out a new potential option strategy. What do you think of these options moves? Do you use put options to effectively set limit order on companies you want to purchase? 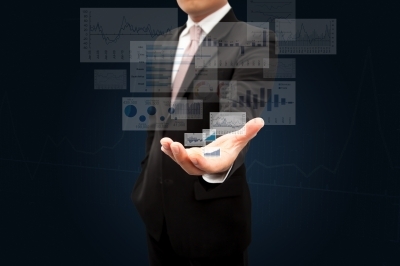 Have you used call or put credit spreads to make directional bets on a specific security? Thanks for sharing, JC. Some good profits booked overall...great going!! That income adds up over the course of a few trades. I am not familiar with the credit spread option trades, so thanks for the primer. I will have to read more to really understand and wrap my head around it. Yeah all 3 of those puts provided good balances of option premium and downside protection. Although I'm happy to close them out early at solid profit levels and look for opportunities to put that capital to work via new put options. From the research I've done I like the spreads although it's very much a numbers game. I need to learn a lot more about setting up the trades for good profit levels to put myself in a better position to utilize the strategy over the long term. Let me know what you find out and what you think about it. Great update. I've read about credit spread options, but I've never tried it yet. It's great to see you testing out new ways to make money. I'll be monitoring your progress closely. It seems interesting for investing small amounts of capital although commissions will really take a big bite out of the potential profit especially if you close the position early. But it's worth investigating a bit to see how I feel about them and there's no better way than to just jump in. Great to see the love for options spreading! My personal experience has been you can make "enough" with simple written calls and puts that getting fancy with spreads is completely unnecessary. At least, over 4 years into FIRE, I've more than covered my annual budget plus some with simple strategies. To each their own though. My general thesis is that a simple call/put strategy is likely the simplest and can provide plenty of premium income. But the big downside to that is that it requires a lot more capital upfront. I'm testing out the spreads just to see how I feel about them after I get some skin in the game. I like them in theory, but I do have to say I prefer the call/puts but it's a bit harder to do those with lower amounts of capital. I think the spreads are a better way to spread things out a bit with my FI Portfolio cash since it isn't likely to grow much via savings for a bit. So spreads could be an avenue to grow it in the meantime. It's a test worth taking in my opinion since the risk is defined.